See also: Carnegie Libraries; Public Libraries; Library history: NC Digital Collections. The North Carolina General Assembly established the State Library in 1812 as a collection of public documents-chiefly laws and legislative journals-for use by legislators and other state government officials. In authorizing the secretary of state to collect and maintain these publications, legislators placed North Carolina in the midst of a national trend. Although such states as Pennsylvania, South Carolina, and Virginia had established collections of public documents in the colonial period, formal development of state libraries did not begin until the early nineteenth century. In North Carolina, legislative committees established policies for the library that were carried out by Secretary of State William Hill. Although in its early years the State Library of North Carolina grew chiefly through exchange of documents with other states and the federal government, the collection quickly evolved into more than a legal reference collection. In 1816 the General Assembly authorized an annual expenditure of $250 for the purchase of books for the "public library." Legislators doubled this sum in 1821. Although appropriations were not always expended, these funds allowed the State Library to develop a collection much broader in scope than originally intended. By 1827 its 1,200 volumes included works of agriculture, biography, geography, history, literature, science, and travel. Since the libraries housed at the University of North Carolina in Chapel Hill were perhaps the only other significant collections in a public institution in the state, legislators appear to have viewed the State Library as a statewide literary resource. Virtually all of the State Library collection was destroyed in 1831 when the State Capitol building burned. Three Whig governors laid the foundation for a new collection during the 1830s and 1840s. Beginning in 1834, the Literary Board carried out a legislative mandate to develop a new collection. Governor David Lowry Swain, acting on behalf of the board, acquired the extensive library of visionary state leader and jurist Archibald D. Murphey; with the assistance of William Gaston, a member of the North Carolina Supreme Court, he also purchased basic legal works. State librarians discharged various duties in North Carolina. Like their colleagues in other states, they compiled and published catalogs of the collection. In addition to acquiring books approved by the trustees, they oversaw the binding of newspapers and books in poor condition. Until 1871, they managed the library of the state supreme court. In 1859 the General Assembly instructed the state librarian to establish and manage libraries for both of its houses. During the late nineteenth and early twentieth centuries, the State Library made improvements in collection organization, placed increasing emphasis on historical work, and served a variety of clients. In 1901 the General Assembly appointed a committee to author a plan for developing the State Library's collection. The committee chose to emphasize works pertaining to North Carolina or by North Carolinians. Although fiction by North Carolinians would be acquired, the State Library was to become strictly a reference collection. The facility was heavily used by local residents, including college students and schoolchildren, whose educational standards were being raised by a vigorous statewide plan of improvement. Legislation passed during the 1970s affected the State Library in significant ways. 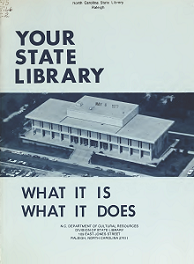 As a result of Governor Robert Scott's reorganization of state government, the library in 1971 lost its status as an independent agency, becoming an office of the Department of Art, Culture, and History (later renamed the Department of Cultural Resources). Its governing board was replaced first by the State Library Committee, then, in 1981, by the State Library Commission. Through the leadership of state librarian David N. McKay, the General Assembly in 1977 authorized the State Library to take a lead role in promoting cooperative endeavors among libraries of all types in North Carolina, as well as with national or regional entities. Although the State Library continued to fulfill many of its traditional functions during the next 20 years and took on new responsibilities such as the Summer Reading Program for children in public libraries, it also carried out this legislative mandate. In the early 1980s it assisted libraries in developing "zones of cooperation." It was instrumental in the development of the North Carolina Online Union Catalog and administered the North Carolina Information Network, which by the end of the 1990s was providing widespread access to electronic bulletin boards and the library's online catalog. In 1987 the General Assembly passed the North Carolina Documents Depository Act, which designated the State Library as the official repository for all published state documents and as a clearinghouse for the distribution of documents to depository libraries statewide. Beginning in 1989, the library played a major role in administering the United States Newspaper Program, a federally funded project to identify, microfilm, and catalog historic newspapers. 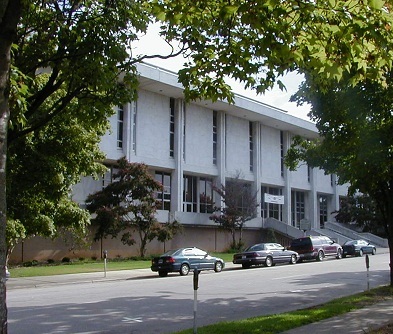 The State Library has also provided much current information about the state through its FTP, Gopher, and World Wide Web servers, and has assumed a leadership role in the development of NC LIVE, a cooperative effort to provide important electronic databases to libraries of all types throughout the state. Charles R. McClure, ed., State Library Services and Issues: Facing Future Challenges (1986). Thornton W. Mitchell, The State Library and Library Development in North Carolina (1983). Maurice C. York, "A History of the North Carolina State Library, 1812-1888" (M.A. thesis, UNC-Chapel Hill, 1978). York, Maury. "A History of the North Carolina State Library, 1812-1888: A Research Report Submitted to the State Capitol Foundation, Inc." September 1977. http://digital.ncdcr.gov/u?/p249901coll22,508903. "State Library view from across the street, cropped." December 2, 2006. From Flickr.com user: Government & Heritage Library, State Library of NC. Available from http://www.flickr.com/photos/statelibrarync/315724586/in/set-72157603633829239/ (accessed May 16, 2012).